Urban development continues pushing farther out of cities and into wilderness areas for both primary and secondary residences. As a result, the amount of homes damaged due to accidental and natural forest fires continues to increase drastically. Along with this, there have been recent measurable changes in New Mexico’s climate. The combination of climate change and the shift of residential development to wilderness areas have resulted in millions of dollars in residential damages. In researching various states’ fire protection information, the concept of defensible space continually emerges as one of the primary determinants of a home’s ability to withstand a wildfire. Within the zones of a defensible space around a home, the potential fuels and vegetation are treated, cleared or reduced to slow the spread of wildfire. 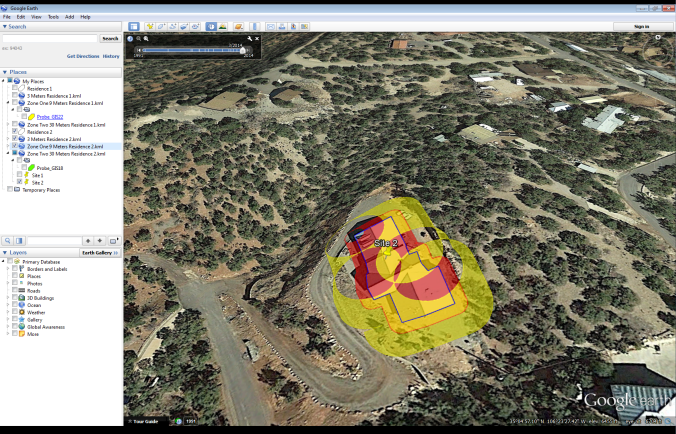 Google Earth and geospatial processing tools were combined to develop a means by which homeowners can determine the defensible space required to allow for the proper defense of their residence in the event of a wildfire. This then provides a cost-effective tool that can be used to educate and aid in the mitigation process when developing defensible space around a residence. The process of creating a defensible space around a residence is fairly simple. First, the polygon tool in Google Earth is used to outline the entire rooftop. This polygon will then be used to generate the buffers. After digitizing the roof outline, the resulting polygon must be exported as a KML. From there, the polygon file is opened using the buffering tool from http://www.geo-news.net/. Once opened it is quite simple to select the desired measurements to complete the buffer zones. These buffer zones can then be imported back into Google Earth to display the defensible zones on top of the aerial imagery. Below are the two resulting images for residential structures that were analyzed through this process which shows the vegetation within the defensible zones to be mitigated to reduce risk. Zone 1 (shown in red) extends 15 – 30 feet from the edges of the structure and Zone 2 (shown in yellow) extends an additional 30 – 100 feet. These images clearly demonstrate the utility of using GIS and publicly available data to create defensible space around a residence that is at risk for wildfire. This project was done by Jacqueline Baros, a senior at Saint Pius X High School, Albuquerque, NM. 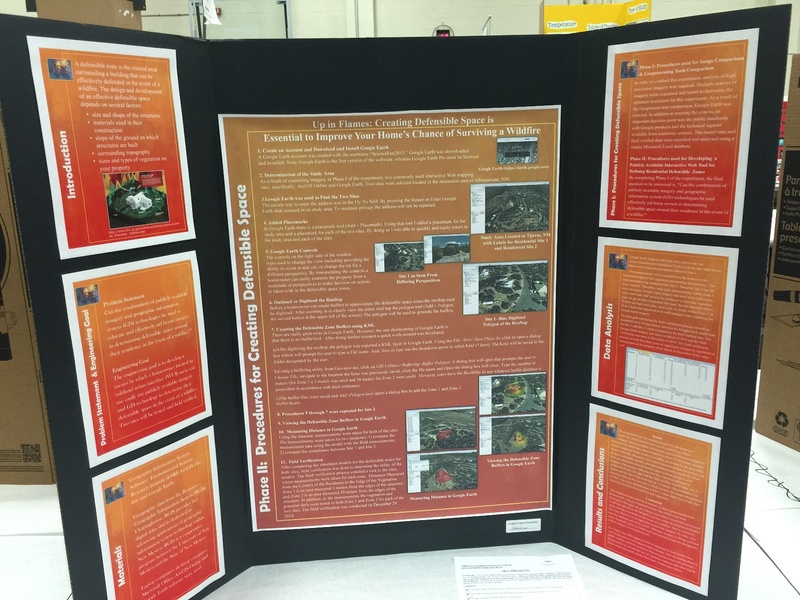 It received the first place award at the St. Pius X Science and Engineering Competition and was presented at the 2015 Central New Mexico Regional Science and Engineering Fair. Science Fair Poster by Jacqueline Baros, Senior at Saint Pius X High School. 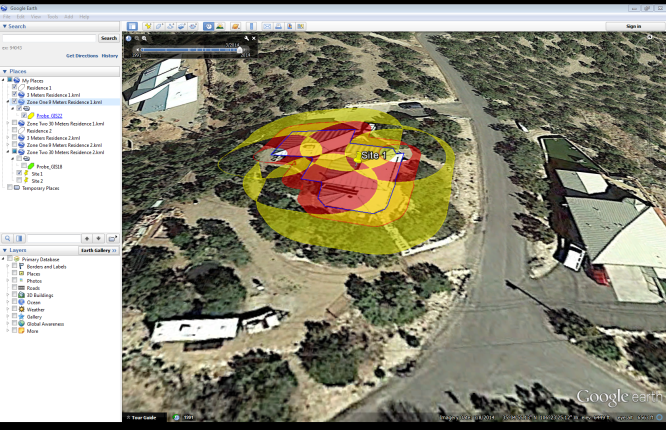 Tagged Defensible Spaces, New Mexico, Wildfire.